(one with a king bed, the other with a queen murphy bed), and large Jacuzzi bath with doors to each room, those traveling together can still enjoy their own space. 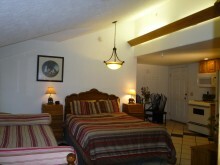 Large upper-story two room suites, great for two couples traveling together or families. One king bed with fireplace in bedroom, one queen bed, one two person Jacuzzi, that opens to both rooms. A combined living room and dining rooom space gives you the opportunity to stretch out and relax. All have two TV/VCR/DVD’s and a full kitchen with pans/dishes, refrigerator, microwave, stove/oven. Plan to stay awhile and ask about a reduced rate for a longer stay. These have an adjoining door to two separate suites, each with microwave, fridge, and coffeepot. 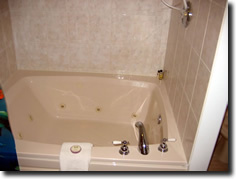 All have a king bed, fireplace, and Jacuzzi bath with shower. 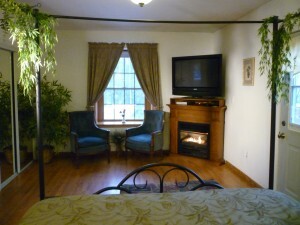 Studios are suitable for one or two people, and can be used as an extended stay apartment. Book Now!, using our secure reservation form.